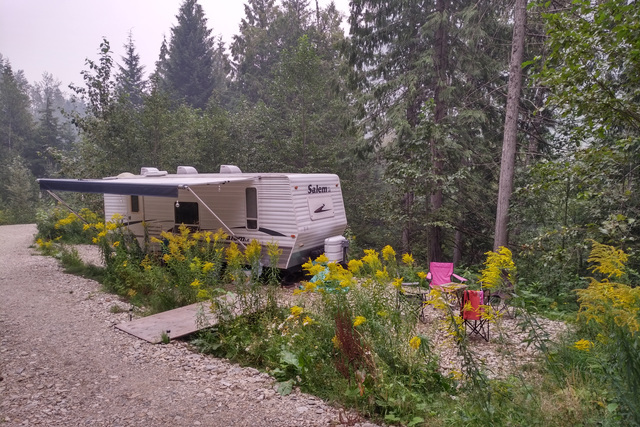 Campsite for rent in a beautiful private location just outside the Big Eddy about a 10 minute walk from the Big Eddy market. Close to the Macpherson and Boulder mountain trails. Longer term rentals only (not by the night). Room for even the biggest RV or fifth wheel - perfect for a tiny home. 15 amp power outlet. Outhouse. Clean creek for water. Road just completely redone. Price is plus power usage. The site is available for the winter however I do not plow my road so you will have to walk in about 200 meters. The creek sometimes freezes so you may have to haul your water in. I suggest you heat with a woodstove or you will have to haul propane tanks in and out 200 meters. Heating with electricity will be expensive and 15 amps is probably not enough. You may say to yourself "why pay for camping when I can camp anywhere?". Well, it is illegal in the City and you risk fines for the property owner. I am just outside City limits. On Crown land you have to move every 2 weeks and won't find anything this close to town. Also because there is power and a good cell signal. Fast internet available with a Telus hub.